2016 has been an exciting year for Georgia Football. With a new coaching staff and fresh talent on the field, the Bulldog Nation is revitalized and looking forward to the future. 2016 also marked the release of Apple’s iOS 10 operating system, which added a variety of new features for iPhone. 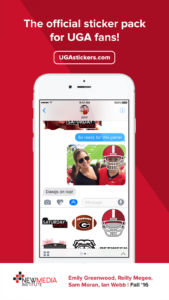 We wanted to take advantage of both of these exciting developments, so we partnered with UGA Athletics to create the UGA Stickers app. New to iOS 10, the stickers feature allows users to “peel” and place stickers on messages and photos to their friends and family. Our goal was to create an app that would use recent iPhone features and create a platform for fans to express and enhance their Georgia pride in a personal and interactive way. Using Apple’s stickers framework, our designers created 18 Georgia Football-themed stickers, ranging from mascots to slogans and jerseys. When iOS 10 was released on September 13, the UGA Stickers app was fully functional and available in the app store for iMessage. The second prong to our project is the expansion and promotion of the app after its initial release. We created various social media accounts and launched a comprehensive promotional campaign, in collaboration with UGA Athletics, which included everything from tweets to scoreboard promotions in Sanford Stadium. Our designers also added 15 additional stickers and released version 1.1 on September 30. As of October 2016, the UGA Stickers app had more than 5,000 downloads.